Willow Canyon STEM Club members mentored future advisers for three new STEM Clubs in the Tolleson School District. Club members led science labs and activities, provided robotics programming and build tips, and engaged in a Q & A session with the new advisers. 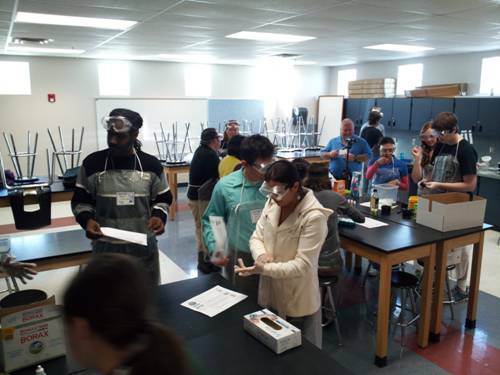 STEM Club also held a meeting to show advisers how to captivate and engage students in some of these activities. Lastly, to complete the adviser training, STEM Club participated in an outreach to the community by holding an interactive and informative booth at a public event. STEM Club distributed competition information, club details, and had several activities where children and adults alike could demo robots. The advisers worked alongside STEM Club on their own build and program for robots, which they showcased to the public. The synergy between schools and the community, for the common goal of STEM awareness, was evident. After a week of training, the new club advisers left with a sense of the importance of involving students in STEM activities- labs, competitions, and outreach- and creating more innovative leaders.